10 I appeal to you, brothers and sisters,[a] in the name of our Lord Jesus Christ, that all of you agree with one another in what you say and that there be no divisions among you, but that you be perfectly united in mind and thought. 11 My brothers and sisters, some from Chloe’s household have informed me that there are quarrels among you. 12 What I mean is this: One of you says, “I follow Paul”; another, “I follow Apollos”; another, “I follow Cephas; still another, “I follow Christ.” 13 Is Christ divided? 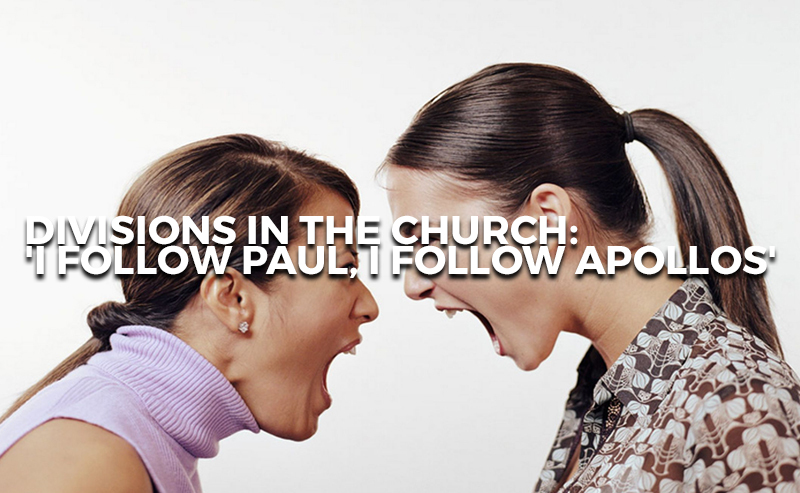 Was Paul crucified for you? Were you baptized in the name of Paul? 14 I thank God that I did not baptize any of you except Crispus and Gaius, 15 so no one can say that you were baptized in my name. 16 (Yes, I also baptized the household of Stephanas; beyond that, I don’t remember if I baptized anyone else.) 17 For Christ did not send me to baptize, but to preach the gospel—not with wisdom and eloquence, lest the cross of Christ be emptied of its power. I’ve seen this concept of division from 1 Corinthians 1:10-17 taken out of context so often lately that it’s beginning to absolutely break my heart. I’m concerned that many Christians are missing one giant piece of the puzzle when it comes to properly understanding this biblical passage. It’s vital that we recognize that the men mentioned in this text (Paul, Cephas, Appolos, and Christ) all shared the exact same doctrine. Remember that in Paul’s letter to the Galatians he recounts his journey to meet with the Jerusalem Apostles (which of course includes Cephas, or Peter) and lays out his entire ministry before them “in order to see if he had been running the race in vain”. This means that Paul laid out everything, his methodology and his theology. The only thing the Jerusalem Apostles (Peter of course being included) even think to mention in response to Paul is that he should remember the poor, to which Paul replies, “the very thing I was eager to do!” The reason Paul goes to such great lengths to meet with the Jerusalem Apostles and the reason he takes the time to include this important meeting in his letter to the Galatians is in order to refute all those who were saying that he was preaching a different gospel (or different doctrine) from Peter and the other Jerusalem Apostles. Paul wanted to prove to these people that this was simply a deceitful rumor that people were using to discount him and his ministry so that they would not be required to submit to his Christ-given, apostolic authority. There is actually zero biblical proof that Paul, Peter, Apollos, and Jesus had even one doctrinal difference. Now, there were certainly a few moments when one of the Apostles willingly chose to sin by doing something in their actions that did not line up with their doctrine. However, when something like this occurred (such as Peter choosing to no longer eat with the Gentiles in Galatia) Paul does not respond by saying, “Well, I guess I believe one thing and Peter believes another.” Instead, he lovingly and boldly approaches Peter and rebukes him. He loves Peter enough to tell him that he is wrong. He does this not only because he loves Peter, but because he loves Christ’s church and doesn’t want to see it divided. It’s also worth noticing that in 1 Corinthians 1:10-17 Paul actually mentions people who say “I follow Christ” as among those who are being divisive. Therefore, Paul cannot be communicating that these four men (himself, Apollos, Peter, and Jesus) each represented different doctrines and stood for separate subgroups of Christianity (or denominations). Rather, what Paul is speaking by the Holy Spirit is simply this: “Quit competing with one another for spiritual status by your petty claims to fame.” See, what was really going on in the church at Corinth is that people were simply trying to one up each other by making childish claims to fame. They were saying things like, “I was baptized by THE Apostle Paul” or “I PERSONALLY know Peter” or ” I was one of the ORIGINAL people who followed Jesus Christ around during his earthly ministry”. This is the biblical context of this passage. I say all that to say this: To apply 1 Corinthians 1:10-17 to an individual Christian or a Christian local church that claims to be Arminian or Calvinist is a misapplication of Scripture. And when we use Scripture wrongfully and it is brought to our attention we are required by God to humbly repent. It is simply sin to say that Christians and Christian churches who take a visible stance on doctrinal issues such as Arminianism and Calvinism are wrong for doing so and that they are being divisive. These people or churches may use a divisive tone or possess a divisive attitude which should be lovingly confronted, but for an individual or a church to simply announce their doctrinal position and occasionally preach it with passion and conviction is a wonderful thing that true Christians should never discourage. The statements “I follow Calvin” or “I follow Arminius” are not the same as the statements being made in 1 Corinthians 1. They are not petty claims to fame. To claim to be Arminian or Calvinist is simply to make the claim, “I follow Jesus Christ and I understand the Scripture to represent him like this”. These doctrinal labels must certainly be communicated humbly, but they should not and cannot be utterly neglected in the name of “unity”. Honestly, I am deeply concerned for the church in America today. It is of my opinion that the church is being strongly encouraged to forsake its right priority of doctrine and truth for a wrong priority of some skewed form of “unity”. True unity is a absolutely wonderful thing, however, if we unite the church to nothing but watered-down, convictionless doctrine, what real good will we have accomplished in the end?